I love to start my day with a nutritious and filling breakfast. This one is naturally sweetened and has no added sugar. If you love the Almond Joy chocolate bar you gotta give this smoothie bowl a whirl! This a great, healthier alternative. Small handful ofÂ Enjoy Life dark chocolate chips or make it a large handful if you love lots of chocolate! Place the 2 frozen bananas, coconut chunks , and coconut milk into the blender. Blend on smoothie mode until ingredients are well blended. Add more coconut milk if necessary. In a saute pan melt down the coconut oil. Place the coconut flakes in the pan once the coconut is melted. Use a medium heat setting for this. Continue to warm up the flakes until they are nicely toasted and have a golden color. Remove the banana and coconut mixture from the blender cup and place in a bowl. Top your smoothie bowl with the toasted coconut flakes, slivered almonds, and the chocolate chips. 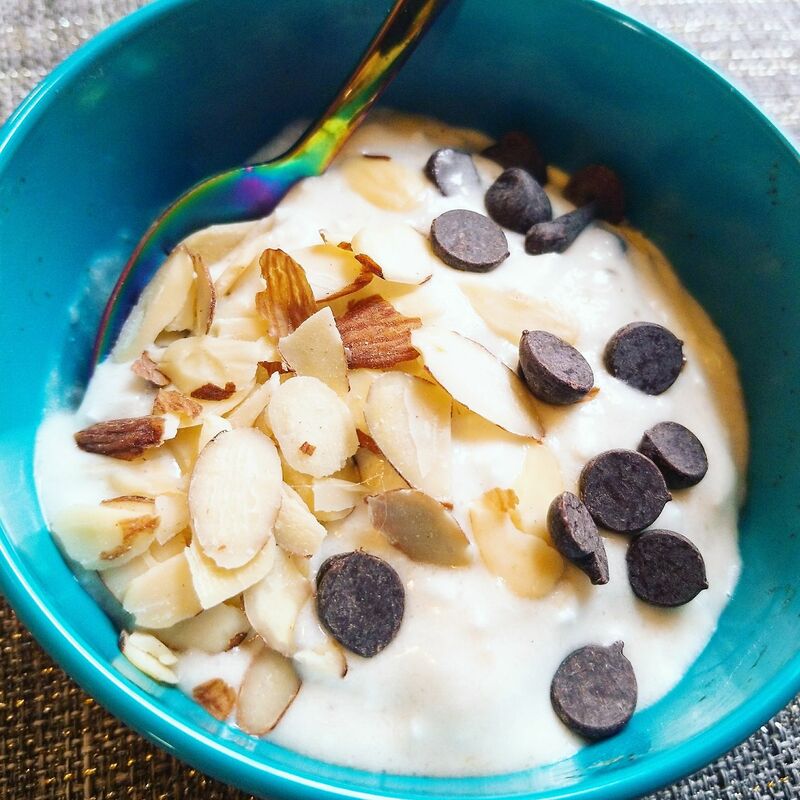 Enjoy your Almond Joy smoothie bowl without too much guilt! Makes 1-2 servings so you can enjoy it all by your sweet self or share with a loved one. This post contains Amazon affiliate links. I do receive a small commission if products are purchased through those links. This entry was posted in Recipes and tagged banana, breakfast, chocolate, coconut, recipe, smoothie, smoothie bowl. Bookmark the permalink. I would love to have this for my breakfast! Usually I have a bagel with cream cheese or a bowl of low sugar cereal. I like a nice breakfast of eggs, meat, potatoes and toast every now and then too! The smoothie bowls you make are awesome. You made me one once and it was delicious!! Don’t be a stranger! You are always welcome for breakfast, lunch, and dinner!